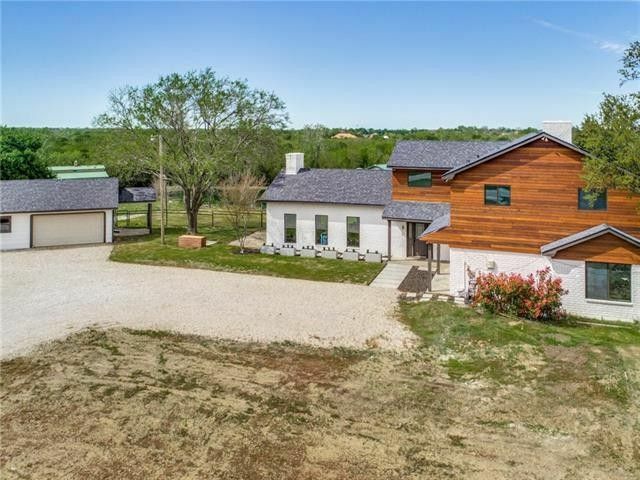 One of a kind horse property has lake view on 2.142 acres with 35x45 shop & backing up to Trinity Trail. Unique exterior has painted brick, Ipe wood & detached 3 car garage. Expansive living room with mahogany ceiling & Brazilian wood floors. Exquisite kitchen features rift sawn red oak cabinets, quartz counters, Teppanyaki cook-top & 2016 appliances. Enchanting master suite with sitting area, new free standing tub & his&her closets. Entertainers delight with inviting pool, travertine patio, outdoor kitchen with grill, smoker, double kegerator & sink. No expense spared with 2 new 21 seer AC units 2016, new aerobic septic system, new 50 yr. roof, new windows, new carpet, resurfaced pool 2016 & foam insulation.